China launched the Shenzhou XI manned spacecraft on Monday morning to transport two astronauts to the Tiangong II space laboratory. The spacecraft was sent skyward at 7:30 am atop a Long March 2F rocket from the Jiuquan Satellite Launch Center in Northwest China. It is carrying two male astronauts – 49-year-old Jing Haipeng and 37-year-old Chen Dong. After the launch, the spacecraft will travel two days before docking with the Tiangong II, which was lifted from the Jiuquan center in mid-September. Then the astronauts will enter the space lab and stay there for 30 days, which will be the longest space stay by Chinese astronauts. The core tasks of the Shenzhou XI mission are to test rendezvous and docking technologies for the country's planned space station, to verify the life-support capability of the spacecraft-space lab combination as well as conduct scientific research and test engineering experiments, according to Wu Ping, deputy director of the China Manned Space Agency. 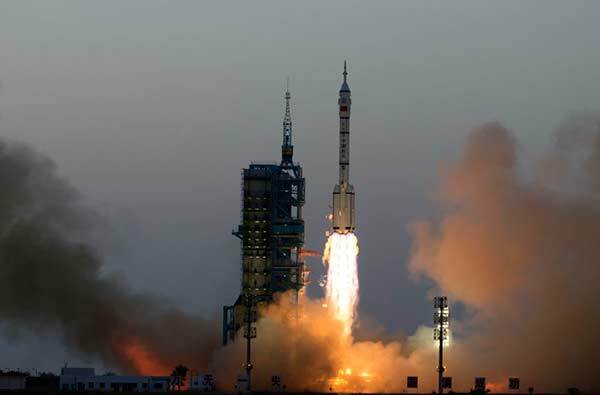 Prior to the Shenzhou XI, China had sent five spacecraft and 10 astronauts to space since 2003, when it lifted the Shenzhou V to carry the nation's first astronaut Yang Liwei, who is now a senior space official, into space. China is the third country in the world that has independently fulfilled manned spaceflight following the former Soviet Union and the United States. 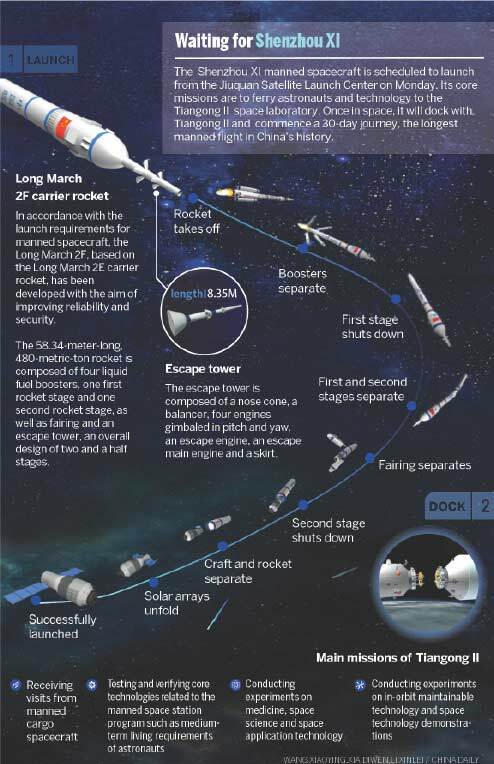 China's manned space program, a source of national pride, aims to place a permanent manned space station, which will consist of three parts — a core module attached to two labs, each weighing about 20 metric tons —into service around 2022, according to the manned space agency. The cold atomic space clock, the first of its kind in space, has carried out several tests with stable results, as expected. Scientists believe that such a clock can help to synchronize other atomic clocks more precisely, and that the technological development will create more possibilities for further explorations in space. The multi-angle wide-spectral imager has captured a range of information on oceans and land as well as changes to clouds, aerosols and water. The stereoscopic microwave altimeter has applied interference image technology to observe sea surfaces, parts of the Yellow River, the Taklimakan Desert, lakes on the Tibetan Plateau and the Lancang-Mekong River. An agricultural experiment has sprouted seeds of Arabidopsis thaliana, a small flowering plant, and rice. Samples will be cultivated in space and carried back to the Earth by astronauts. The space-Earth quantum key distribution and laser communications experiment has established stable connections between the space lab and ground stations. Why will Shenzhou-11 carry only two astronauts to space?